1 x 50's Inspired Retro light oak round dining table with slanted legs and a hard wearing smooth and crisp satin laquer finish. 4 x 50's Inspired Retro light oak dining chair with slanted legs, curved seat, curved back and hard wearing smooth and crisp satin lacquer finish. 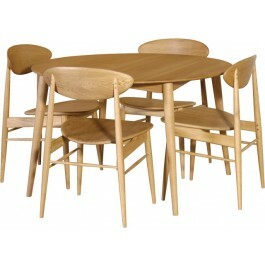 1 x 50's Inspired Retro light solid oak round dining table with slanted legs and a hard wearing smooth and crisp satin laquer finish. 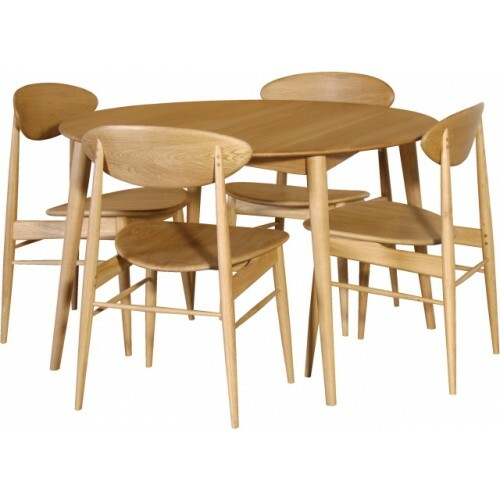 4 x 50's Inspired Retro light solid oak dining chair with slanted legs, curved seat, curved back and hard wearing smooth and crisp satin lacquer finish. Took delivery of the dining table set on Friday. We are very pleased with it. The design is a very cool retro 50s look and the quality and comfort are both excellent. It was delivered by a very helpful driver who assembled the table, checked everything was OK and took away the packaging - what a great service - thanks.